WICHITA, Kan. - Sept. 27, 2014 - PRLog -- Things are heating up in the Don Gay Bull Riding Tour and United Bucking Bulls, Inc. National Finals. The second night of the three-night competition kicked off to the roar of a Friday night crowd at the Kansas Star Arena in Mulvane, Kansas. The top-50 bull riders in the DGBT went head-to-head with the top-50 4-year-old Classic bulls of the UBBI, Inc.
With a championship title and nightly prize money totaling $10,000, on the line, the bull riders are feeling the pressure to advance in the standings. Adding to the incentive for the cowboys is the thought of driving off into the sunset in a new F-150 Ford pickup truck from Mel Hambelton Ford in Wichita. “Winning the truck is a real special deal for the cowboys. I won eight world titles, and I never won a truck. I got the use of one a few years, but in our deal, when they win it, they get the keys,” said eight-time World Champion Bull Rider, Don Gay. Leading the standings is 17-year-old Texas High School Rodeo Bull Riding champ, Brody Yeary, Brock, Texas, who has a current season earnings total of $13,575.38. The No. 2 guy on tour is Ryan Reynal, Ft. Worth, Texas, whose current total is $11,056.83. With one more night left in the competition and $10,000 in prize money to be won, it is anyone’s guess which rider will emerge victorious. You can’t count out veteran rider Ronny Kitchens, Mansfield, Texas or No. 4 rider Derrick Harris, Ivan, La., in the race to the top. However, none of the top-four riders made the whistle in the Friday night performance. With a huge leap after the night’s competition, it was Kansas native Jordan Sammons taking home the win. Sammons is the only rider of 50 to make a full eight-second ride on Talbert Bucking Bulls’, Hurricane Rick. Sammons, who’s originally from Kansas, posted a score of 85 points on the bull and walked away with $3,630 in Qualified Ride and Rank-Rider Score money. The cowboy had not had a chance to compete much at earlier DGBT events this year but set his sights on making it to the finals, and being able to come back to his home state. 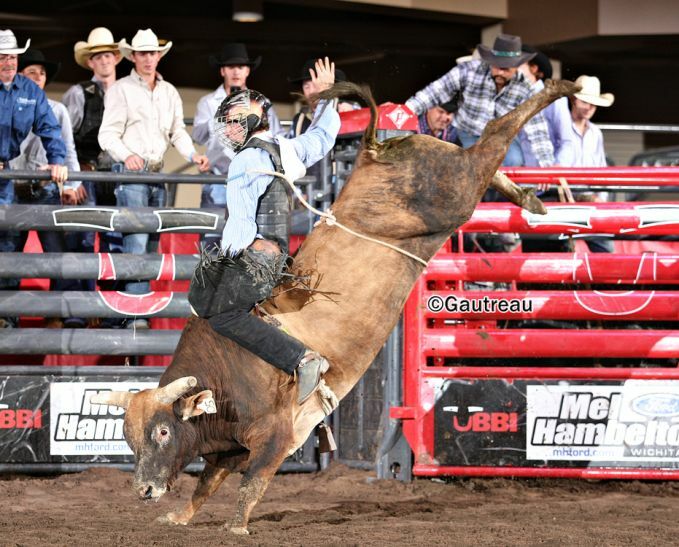 Despite there being just one qualified ride, the DGBT awards money in a Rank-Rider Score determined by talent from the bull with effort from a rider for at least a three-second ride. The winner of the Rank Ride was Josh Barentine, Johnson Bayou, Louisiana. Barentine rode Mike Rawson’s bull, Pinto Bean for 6.54 seconds and took home prize money totaling $1,400. “I’m used to riding bulls and getting paid for the eight-second ride, but in this deal it works out for the benefit of the bull rider, at least reward the bull rider for the best effort,” Barentine said. Barentine explained that the bull he rode was strong and not an easy one to ride, but one that if you do ride, you’re going to score high. He added that rank stock is a common theme within UBBI bucking stock. “UBBI is a good deal. If you want to ride bulls and be a good bull rider, you need to come here first and get your priorities straight,” he said. Speaking of rank stock, the bull that won the round for the night was Folds/Strickland/Nelson/Ray/Melton’s bull, Bad Tattoo. Bad Tattoo scored a high 89 points bucking off rider Treven Ward. And it’s perhaps no surprise he won the evening’s honor, the bull is already the No.1 ranked bull in the Classic Qualifiers standings. Cory Melton, co-owner and trainer, explained they began bucking Bad Tattoo in April. He praised his consistency all year. “He’s won first a few times, but he’s been placing just about everywhere, so he’s probably been the most consistent bull on here, if not the best,” Melton said, citing the bull’s intensity for landing him in the top-end of the spectrum of bulls. “You can count on him,” Melton said proudly. The top-25 bulls from the Friday Classic, will join the top-25 bulls from Thursday’s Derby in Saturday night’s final performance. The top-10 Futurity Bulls will compete in a special Bonus Round as well. And we’ll finally see which of the bull riders gets the truck keys. Will it be the teenager, the veteran, or even, the surprise Kansas kid?